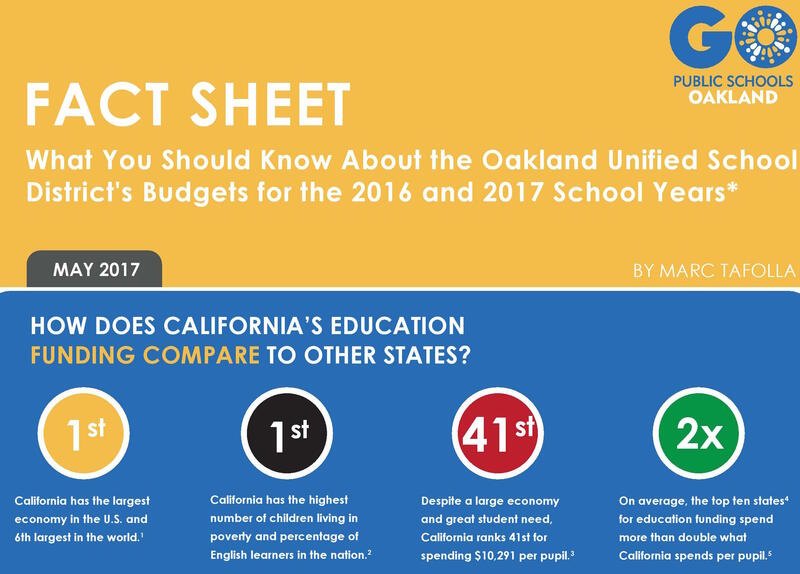 Today we are issuing a fact sheet, What You Should Know About the Oakland Unified School District’s Budgets for the 2016 and 2017 School Years, which provides a snapshot of the budget using data and information from the district. In the fact sheet, you will learn more about the state of the school district’s budget and the issues that led to the deficit. Click here to view and download the fact sheet. The budget for the upcoming school year is due to the Alameda County Office of Education by June 30, 2017. In advance of this deadline, we also have published a series of blogs on the budget to help families, educators and community members gain a better understanding of the school district’s finances and provide input on the budget proposals. Recently, we also held a briefing on the budget attended by families, educators and community members across the district. At the event, participants were able to hear from School Board President James Harris and the district’s Senior Business Officer Vernon Hal and share their questions about the budget. We are committed to working with school leaders and our community towards a budget that ensures all students receive equitable education opportunities and sets the Oakland Unified School District on the path to financial stability. If you haven’t already, we encourage you to make a commitment to help with this effort.